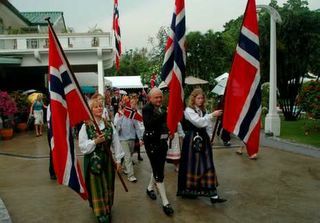 The Norwegian National Day. 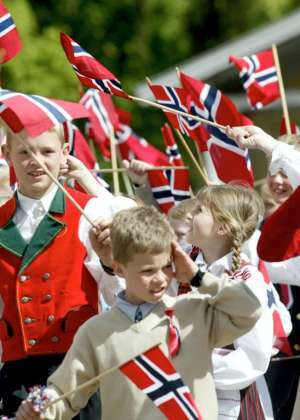 Norway celebrates 100 years as an independent state this year. Your 100 year as a nation? Anyway congratulations. And yes, it's 100 years as a state. But we're far older as a nation. Don't confuse the two. 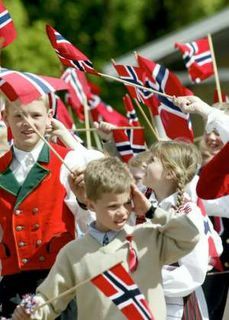 Happy 100th anniversary as nation-state, Norway. Best wishes on your 100 years' anniversary and your national day. PS -- those crosses on the flag. Definitely haram. In Sweden such a display in public would have been doomed and branded as "racism" by the pro-terrorist PC crowd, the lot of them. Happy anniversary. You still have one nation and state. "In Sweden such a display in public would have been doomed and branded as "racism" by the pro-terrorist PC crowd"
I know. That's one of the reasons why Norway still has a slight chance of making it out from this intact as a nation. The prospects for Sweden are dim. However, we already have people who want this to be a "multicultural" celebration, with Pakistani and Somali flags used on the Norwegian National Day. The existence of all these blond, blue-eyed infidels in the Islamic State of Norway is intolerably offensive to the Muslim umma. May Allah smite them. Their property and their women belong to the Muslims. "The existence of all these blond, blue-eyed infidels in the Islamic State of Norway is intolerably offensive to the Muslim umma. May Allah smite them. Their property and their women belong to the Muslims. Is that you, mullah Krekar? How are things? Blown up somebody lately? Congratulations, Fjordman. Let's hope the mullahs don't take over and screw up your nation, your people, and your values like everywhere else they've poisoned in their "too" long history. When all flags are allowed in celebration of the National Day I will bring in the American. That might make these people rethink. I hope that day will not come son. President Bush - Darth Vader? Iran's mullahs give Europeans "Ultimatum"